Hello! Long time lurker finally found a reason to register on the forums. I made a Graphic set that tries to keep the simplicity and ease-of-recognition of ASCII-like tilesets and add a little beauty and variety of graphic sets. It includes graphics for all creatures in the game: the Civs (Dwarves, Elves, Humans, Goblins, Kobolds and the various underground civs: antmen, cave swallow men and so on. ), as well as all animals, monsters, giant versions and animalmen. Some creatures use the same graphics, though they still have different colors (most fish, and smaller birds, for example). It lets the game determine the color of everything, meaning that you can still easily discern how many marksmen and how many lashers the vile force of darkness just sent to kill you their untimely death at first glance. Animals are now slightly altered, very adorable letters. 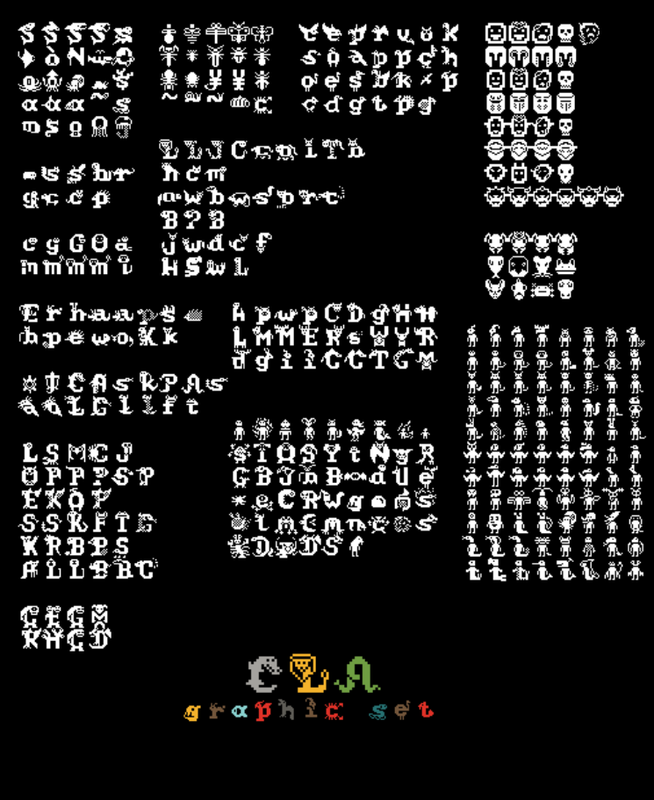 It comes preinstalled with the newest DF version (as soon as I get to update it), its own Color Scheme, a TrueType font with glyphs identical to the tileset, and three 18x18 tilesets. By default it uses "CLA" (the one in the sample images). If you want to try the others (a clean version of the default square 16x16, based on Haowan's, and a version of Taffer's tileset compatible with the CLA creature graphics and raws), open data/init.txt and replace all 4 instances of "CLA.png" with the name of your new tileset. Max™ resized the creature graphics to 18x27, get it here. PM me if you need older downloads. changed tiles for log, doors, and bed. and some more I can't remember. 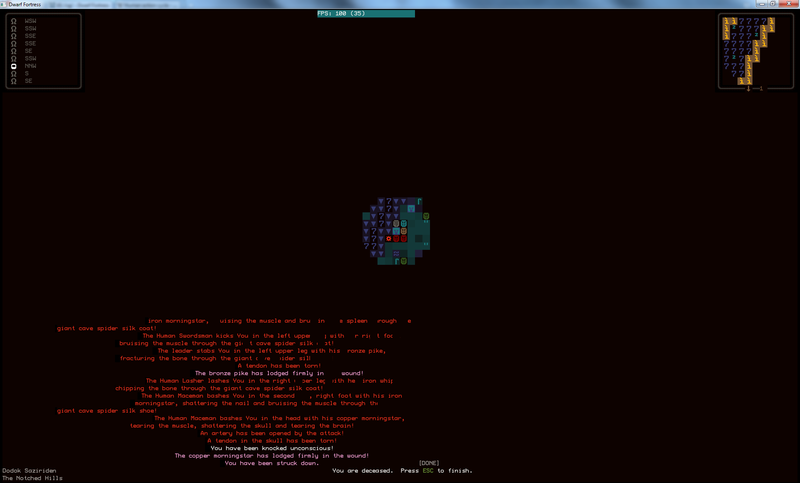 -fixed Animated Corpse for Human, Goblins, Elves, and Dwarfes. Anonymous: created Myne tileset (modified Haowan); his soldier tile was the original inspiration for all of this. Taffer: modifed and maintans a version of his own tileset in 18x18 for CLA creatures. It's included in the download! 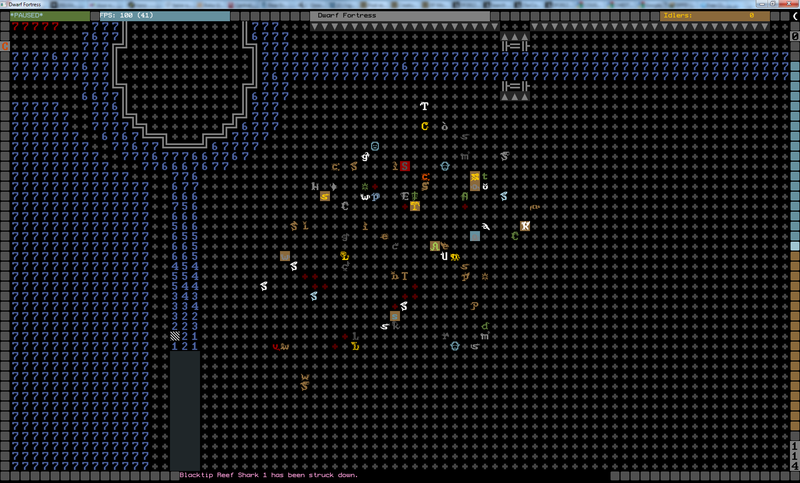 Haha so many people want dwarf fortress to look like this. I like it. Very creative middle ground. I love the burning dwaf tile but I can't tell what animals are pictured there, except for cats, because those are similar to ascii and cat head is discernible, everything else are some distortions on the letters. I can see getting used to it. I LOVE you work. You kept the minimalism of the original program and you are offering an easiest and better view of the subject. KEEP UP THE GOOD WORK. To me, this should be the most official of the unofficial. fourth one across looks like a 3 eyed cow. Added Graphics for Copperhead Snake, King Cobra, Crab, and Weasel. Also, after trying to find a Necromancer tower for HOURS, I finally noticed that I can just test the zombie graphic in Arena mode. Boy, do I feel retarded now. Anyway, fixed Zombie graphic. DF repo seems to be down so I only updated the mediafire mirrors in the OP. everything else are some distortions on the letters. That's sort of the intention. Just as without any graphic set, you primarily try to identify the animal by color and first letter. Except now it's a little easier to notice the difference between a goose, a goblin and a Guineafowl. Same for Cats, Chihuahuas, and Guineapigs, or wolves and weasels. Haha, that's actually the tile for Ghosts. AFAIK you can't assign a tile to the 'burning'-status. Thanks for the V03 release. Err, I downloaded the package with DF 34.06 prepacked into it and all my genders are showing up as boxes  instead of the actual gender. I am very impressed with what you have done here. very good job sir. Yeah, someone else notified me of this as well. I have no idea how I could have missed this glaring problem. The font I supplied doesn't even have characters for male and female. After finally compiling the only free TTF editor for windows, I added them myself. Copy its content into data/art and answer 'yes' if it prompts you to override "font.ttf"
This looks great! i think the main issue people have with normal ASCII is how cluttered it looks, it's the ground which just looks like my sock draw. 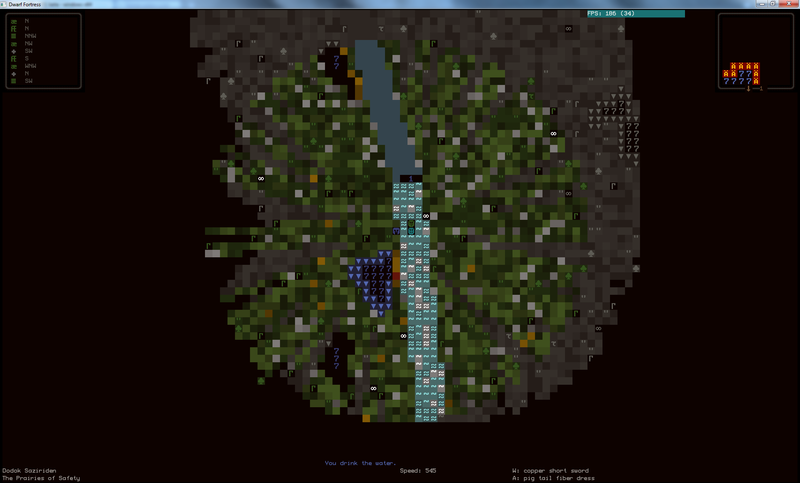 This tileset seems to prove that great middle ground which makes the ground look very reasonable. Great work! The font is also lacking the weight symbol.